Cut the aubergine into medium-size chunks and roast for 20-30 minutes on a lightly oiled baking tray until browned and almost cooked through. 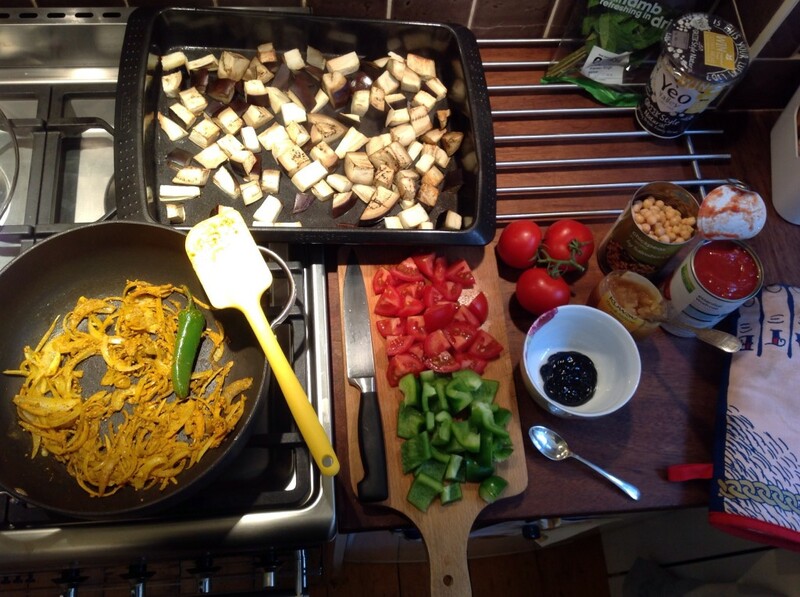 While the aubergine’s cooking, heat the olive oil in a pan large enough to hold all the ingredients, and gently fry the onion, garlic and whole chilli in it for 10 minutes until softened, stirring occasionally. Then stir in the spices including the mustard seeds and cook for a further 5 minutes. Add the tinned tomatoes and simmer for 5-10 minutes, stirring occasionally. 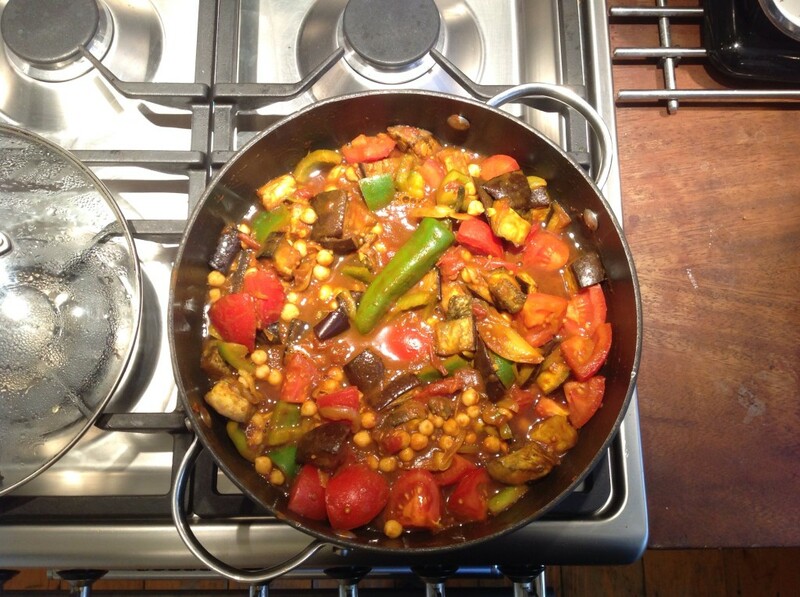 Stir in the green pepper, honey, tamarind and aubergine pieces and lower the heat. Add the chickpeas (drained) and fresh tomatoes and cook for a further 10-15 minutes. Check the seasoning and stir in the mint just before serving. I added a few handfuls of toasted plain cashew nuts and served this with brown basmati rice and a dollop of yoghurt with cucumber and mint. Tasty, tangy and plenty for lunch this week. Challenge #2: Tamarind – what the heck is it? There are many curries that are enhanced by a dollop of tamarind, and this is a great example. It all looks absolutely delicious – exactly the kind of thing I was hoping you would try! I confess though, I’m with Jim. Lamb would make an excellent addition! So, now you’ve tried tamarind, I hope you’ll add it to your store cupboard as a regular ingredient – it’s a very useful thing to have kicking about, and can add a little zing to many a dish. Looks wonderful, so many colours. 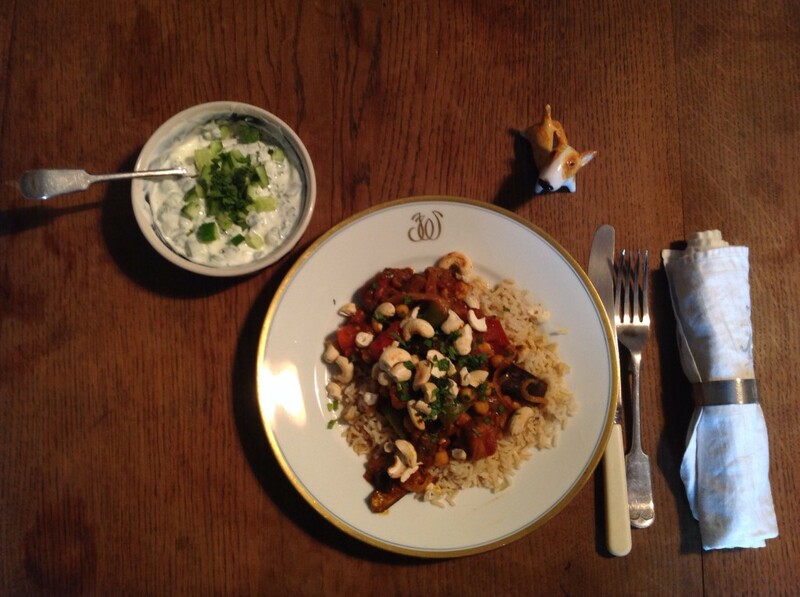 Your pictures really make the process come to life and you are such a tidy cook – unlike Dave! I would love this for lunch. But for dinner – lamb would be delicious added into this mix. Spot the confirmed meat eaters in the audience can you?